I’m reading this book I took out from a magical place called the library. It’s called designing for gestural interfaces. It is fantastic. I’m currently deciding how to use AR or whether I should use it at all. Gestures could be a way forward. This book is full of helpfull things for designing such interfaces. Things like when it’s appropriate to use certain interface features and what they should be able to do. Presence detection is an interesting one. I wanted to have some sort of presence detection anyway, to start things up or reset them when people went away. The book used this term followed by the word spotlights. Interesting. How about lighting up the area when people walk into it and starting up the whole game thing. (It’s pretty much presumed that whatever I’m doing at this point will be a game). 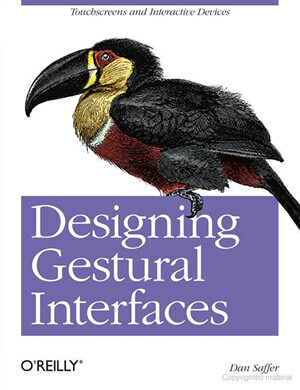 The book also says that THE best use for a gestural interface is for a fun use. e.g a game. How coincidental. I wanted my project to be fun right from the beginning. Fun and mindblowing. What about a gestural or AR based game where mind control controls something physical around you that makes it easier or harder to play the game based on how you are thinking at the time? Like a podium that moves around or moves you around or things flying about in real time? The possibilites are endless! I need better imagination at these times. ← Who needs a mouse?